Some of my favorite planner tricks and tips are totally stolen (long ago, so I shamefully have no sources). As a ethical thief, I must share the wealth with my fellow Planner'ds. Others are completely my own ideas. 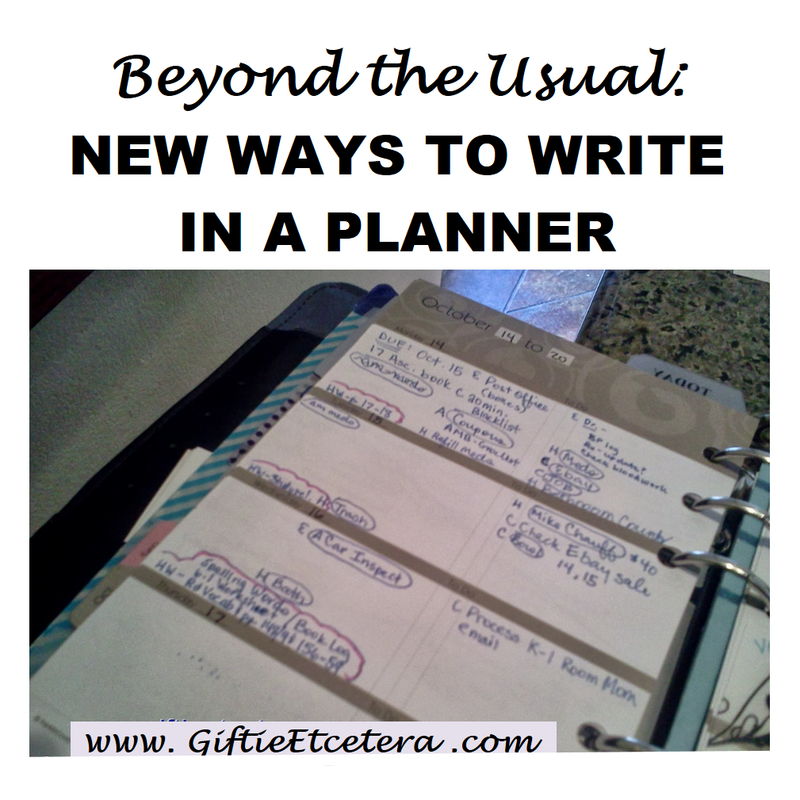 Some of these planner hacks have been mentioned before on the Giftie Etcetera blog, but are worth repeating. 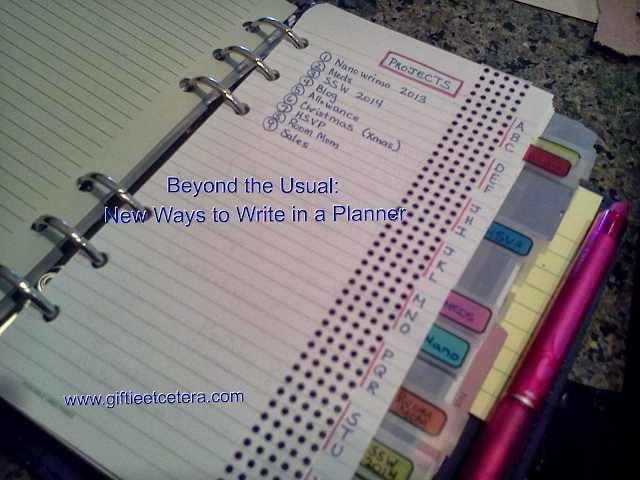 I use all of these regularly in my day-to-day planning. UPDATE: This post was written before I got around to more professional images, so the images are shadowed, amateurish, and sometimes creepy. No matter! The content is worth reviewing. Now, carry on. Perhaps the best filing trick I've ever encountered is to simply put a box in the upper right hand corner of the page with the key word for the Project or Note in the box. It only takes a second and it will make your papers much easier to file away and retrieve. I do the same thing for papers that I am filing at home instead of in my planner, though for important originals, I use a post-it note as the box. Always make an index of what is in your planner. It doesn't need to be in any particular order, but it will help you decide where to file your Projects or Notes and when to start a new Project or Note instead. 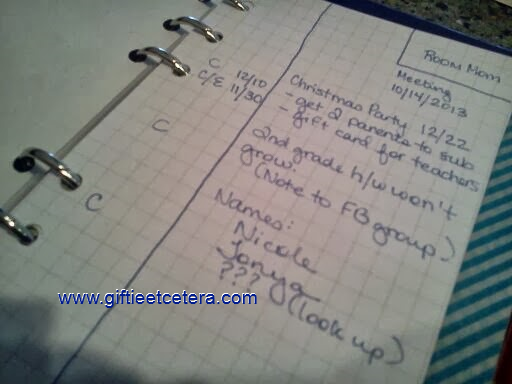 Using graph paper, you can quickly and easily draw a little check off goals chart for any month. This one is intended for National Novel Writing Month, but you can do the same for workouts, calorie counting, or whether you remembered to take your daily medicines. If you want it to become a habit and want to track your progress, the chart is a great tool. 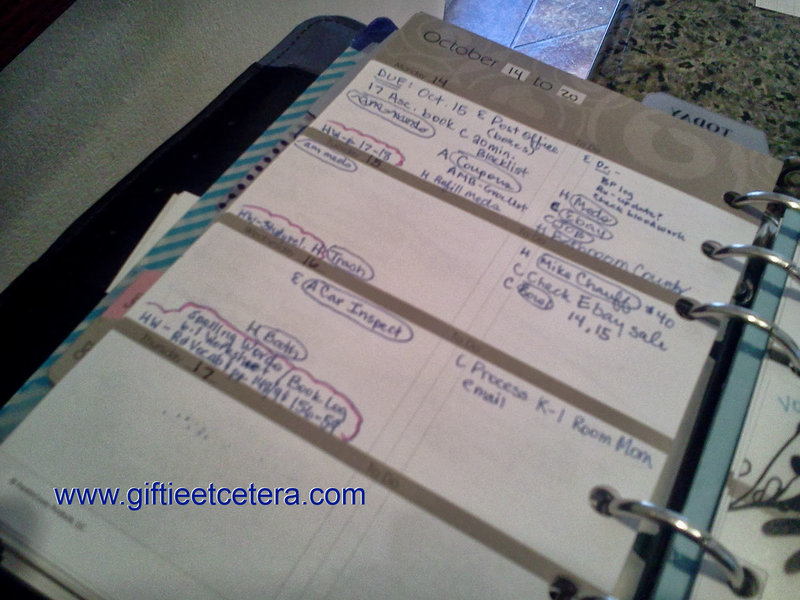 I use my planner as a checkbook/credit card log, as I have shown here before when talking about budgeting. But you can do the same with writing goals (shown here: me trying to write 50,000 words of a novel in November, subtracting as I approach my goal), calories for the day or week, spending, or any other number that you want to track. I don't actually use a highlighter to highlight. Instead, I use a red or pink Frixion pen. But if something needs to be separate or merits special attention, highlight it and it will pop out at you. In this picture, it's my 2nd grader's homework in the bottom left hand corner of each weekly entry. I underline due dates, twice. 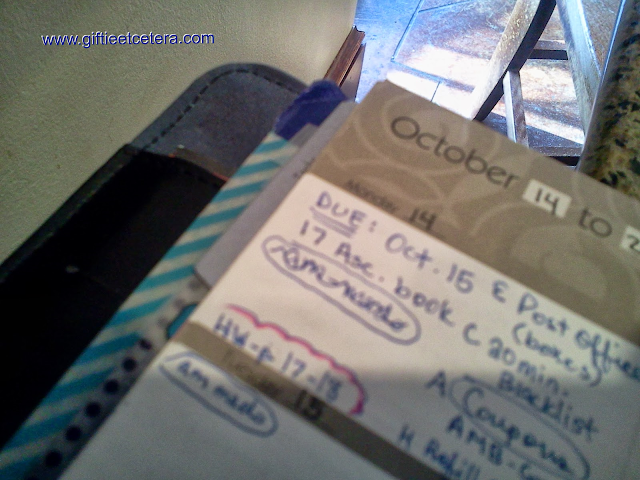 Note my other hidden trick: I write the due date on the day BEFORE the library books (or other deadline) are due. Whenever I take notes, whether at a meeting or for myself, I draw a vertical line about 1/4 into the page. I take notes to the right of the line, but on the left, I make notations of anything that I need to follow up on. Students can also use this technique to note definition terms or test questions to the left. In the example below, I need to email parents to find two substitute teaches for the Christmas party by December 10th. I also need to email parents about a gift card and purchase it by the end of November. @ [name/date/action] = after someone else does their part or a certain date passes or I do part one of the task, I need to take the next action. My advice? 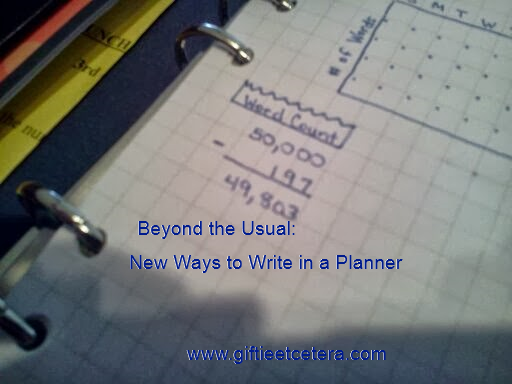 Keep a list of codes that mean something to you in your Notes section of your planner and use them to save space and group like actions together. 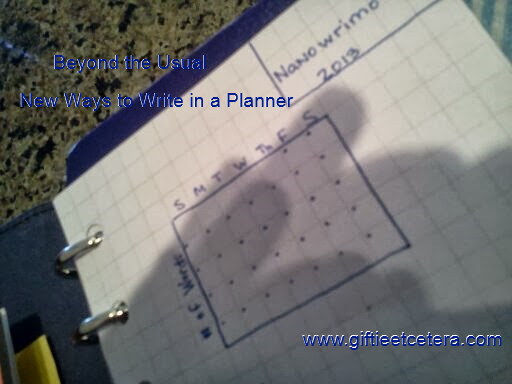 Now, go forth in peace and upgrade your planner to incorporate the best of these ideas! I especially like the vertical lline drawn when taking notes, using the left for codes or actions. Love your blog. Love the legal rule form of note taking and writing. I am so thrilled to have found your blog and to have gotten the chance to get to know you :) Thanks for your amazing posts! Some great tips. I'm going to borrow a couple of those. Great tips! And all I would love to try -- except for the "coding" because I tried that once and forgot what the codes meant, ha ha. THanks. Great ideas here, thanks! But can you talk a little more about how you use the dots and ABC notations on your index sheet? Also, I noticed in your weekly planner page you circle some items? Your ideas really appeal to me, so I'd love to know more! Okay.... I know this post far exceeds the original post, but the tips and tricks you offer are exceptional at any given time. Thank you! I am excited to integrate some of your tips right away. Keep up the great work! Thank you so much for sharing! "ghost from 1980…" hahahha too funny! I'm trying to keep my codes things I can also type, for those times when I also have to have computer interface (like Google calendar and Toodledo). Sometimes that means I have to use TLAs. I'm going to see if any of your codes work for me. I had been putting in a line for a margin, with all the codes and checkboxes on the left. Lately I've been thinking I want to leave it off. 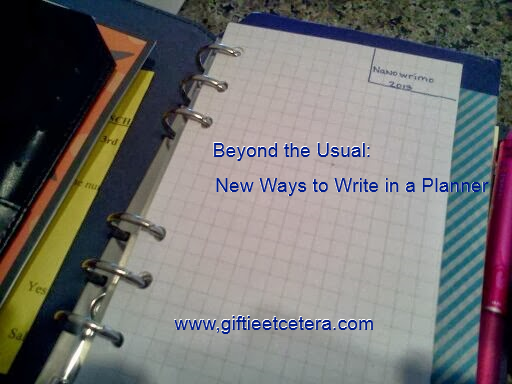 I'm thinking it might help creativity if I leave the page unstructured, but put those things on the far left anyway. We'll see how that works for me. I agree - even without great graphics, the content is interesting and useful. Lately, I have been using a notebook for my planning and I'm doing a lot more bullet-type planning but I like making columns so I can create mini lists to flesh out lines on one of my bullets. It's amazing how good planning techniques help me become more organized and more efficient. I tried the line tip after reading this blog. It worked brilliantly! Thank you so much for the idea!